On the day after Thanksgiving, we thought we’d share with you an excerpt from our new book. Turkey Tetrazzini is what home cooks of the Mad Men generation did with their turkey leftovers. Buon appetito e felice ringraziamento. Recipes are never static; they spawn imitations and adaptations. And they travel—around a neighborhood or between continents. Sometimes the “original” recipe—which may never have been written down—is lost. A good post-Thanksgiving example is Turkey Tetrazzini. Named to honor the Florentine opera diva, Luisa Tetrazzini (1871-1941), the combination of boneless turkey, mushrooms, and pasta in a white sauce, was supposedly created by the French culinary doyen, Auguste Escoffier. 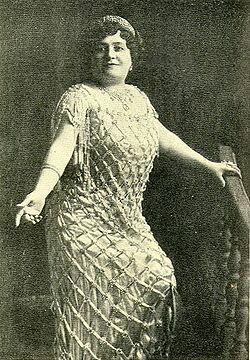 Donna Luisa sang before enthusiastic audiences in San Francisco, and murky sources claim the dish first appeared there between 1907 and 1910. The coloratura’s most flamboyant appearance was not on stage, but on the street, in front of the San Francisco Chronicle building. Barred from opera houses in New York because of a contract dispute, Luisa Tetrazzini swept into San Francisco, proclaiming (long before the flower-power fests of the 1960’s), that “the streets of San Francisco are free” and that she would “sing in the streets.” Indeed, she performed on Christmas Eve 1910, for a crowd estimated to have exceeded 200,000. Turkey Tetrazzini’s only connections to Italian cuisine seem to be spaghetti and the dish’s name. While Escoffier had a propensity for naming his creations to honor opera stars (Tournedos Rossini, Peach Melba), there is no published evidence that he created Turkey Tetrazzini any more than there is corroboration that he ever visited San Francisco. Domesticated poultry have never figured heavily in the cuisines of Italy. Nonetheless, a turkey might appear on a Christmas table. As European turkeys tend to be leaner than the mega-birds bred in America, holiday turkey leftovers would probably have ended up as ingredients in a soup stock or minced as stuffing for tortellini or ravioli. Here in America, what to do with left-over turkey has given rise to thousands of recipes. In the tradition of operatic hyperbole, one could claim that there are hundreds of Turkey Tetrazzinis. And though more than a few of them appear in modern European Italian and Latin American cookbooks (Luisa Tetrazzini also toured South America, which had large Italian immigrant populations), the recipe seems to have first “happened” here in North America. Bring a large pot of salted water to the boil and then add the spaghetti. Cook until the pasta has reached the al dente state. Drain in a collander and reserve. Meanwhile, heat a large sauté pan over medium-high heat and add 3 Tbs butter. When the butter has foamed and the bubbles have begun to subside, add the mushrooms, lower the heat to medium and sauté for approximately 10 minutes, until the mushrooms have given up their liquid and it has evaporated. Remove from the heat and reserve. Heat a 2 – 3 quart saucepan over medium-high heat and add 3 Tbs butter. When the butter has melted, stir in the flour and cook the mixture over low heat, stirring constantly, for approximately 3 minutes. Gradually stir in the milk, cream, broth, and the wine. Raise the heat to medium-high and cook, stirring constantly, for about 5 minutes or until the sauce has thickened enough to coat the back of a spoon. In a small bowl combine the remaining 1/3 cup of Parmesan, the bread crumbs, salt and pepper to taste. Sprinkle the mixture evenly over the pasta, and dot with the remaining 1 tablespoon of butter, cut into bits. Bake the casserole on the middle rack of the oven for 30 to 40 minutes, or until it is bubbling and the top has browned. Remove from the oven and allow the casserole sit for 10 minutes before serving. Divide the Tetrazzini equally among six to eight dinner plates and garnish each with the chopped parsley. This entry was posted in Main Courses on November 23, 2012 by Skip.